CHRY04/PC-POD2 Dodge Chrysler iPod/iPhone interface adapter. 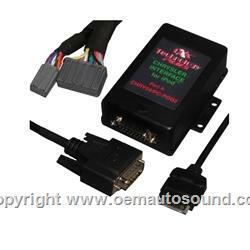 This interface kit will allow you to listen control and charge your iPod using the factory Dodge Chrysler radios that have built in RSE controls provides track up track down, fast forward, rewind function of iPod. You can also use the iPod/iPhone controls Direct connection of the iPod to Chrysler Dodge audio system for optimum CD sound quality. This interface will not allow text to show through radio' display. The CHRY04/PC-Pod2 will also allow the factory Chrysler radio to charge the iPod. Connects to the 22-pin and 10-pin port on the back of the radio. Allows retention of factory Chrysler Sirius satellite radio. Not compatible with factory DVD needs to be unplugged. Works with all iPod's/iPhone/iTouch 5 volt charging. Radio must have RSE controls to work, radio face codes RAK RAQ REC only.